Following a significant community and stakeholder engagement process, the Medina Yard Regeneration team was delighted to secure from the Isle of Wight Planning Committee resolution to grant planning permission (subject to a s.106 agreement) on Tuesday 27th March 2018. The development team secured the extensive regeneration of the Medina Yard site for a hybrid planning scheme compromising part detailed and part outline planning consent to provide 535 new homes, a new modern marine industrial cluster for existing and future marine-related operators on the Island, new business workspaces, a mixture of shops and restaurants with community uses and public access to the Medina. The mixed use scheme will turn this dilapidated old site into a new sustainable place for the future with the Grade II* Listed Hammerhead Crane at the heart of the proposals as a reminder of the site's (and wider Island's) ship building heritage. 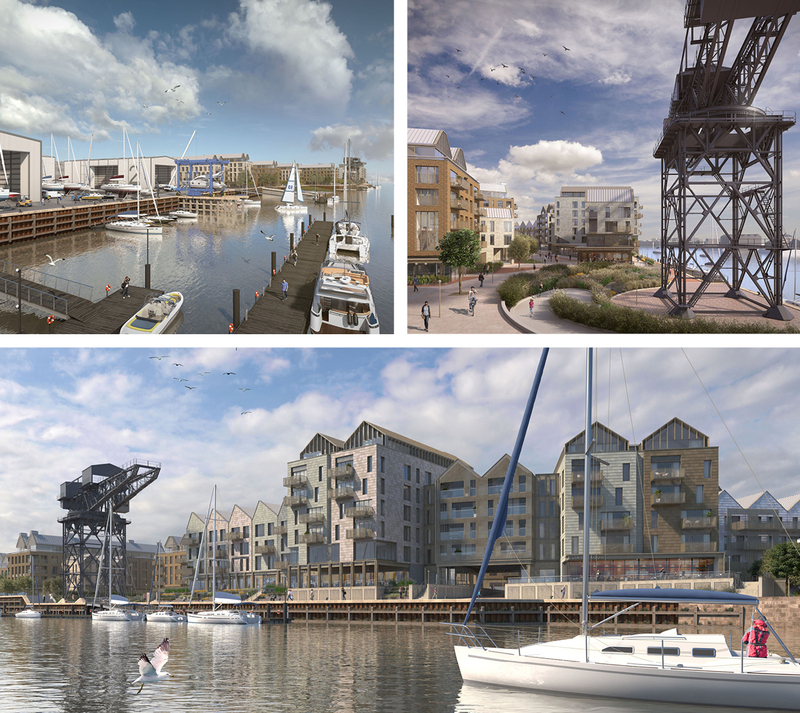 The scheme will open up the site for the local community; provide public walkways along the Medina waterfront and a publicly accessible slipway, together with the delivery of a bespoke heritage boat museum. This high quality environment will represent an exciting new chapter for Cowes and will represent a significant opportunity to deliver new jobs, homes, and community space for the wider community. Medina Yard Regeneration will create a distinctive new mixed use, waterfront quarter, with attractive public streets and spaces which draw on the existing character of Cowes, and strong connections to neighbouring areas including the town centre. Medina Yard is located within walking distance of Cowes town centre and incorporates a prominent 500 metre stretch of river frontage. What was once a prosperous part of the town for large-scale ship building has now become largely obsolescent, dilapidated and isolated from the local community. In 2013 JTP, architects and community planners, appointed by the Harrison Trust, held a Community Planning Weekend to create a new Vision for the site, incorporating a viable mix of uses to support a range of active business, marine and leisure related uses and a variety of residential accommodation. The local community took part in workshops and hands-on planning groups and meetings were also held with local businesses, young people and community groups. The Harrison Trust subsequently arranged community forums and exhibitions throughout 2014 and 2015, providing regular updates on the proposals as well giving the community the opportunity to submit further feedback. For more about the Vision for Medina Yard please go to Community and download the Community Planning Weekend Report Back Broadsheet.